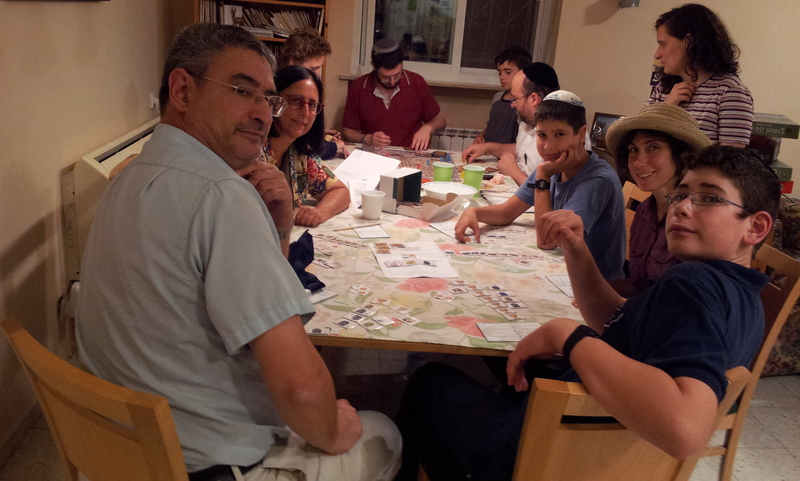 First time attendance for Eli, a young lad who lives in Har Nof. 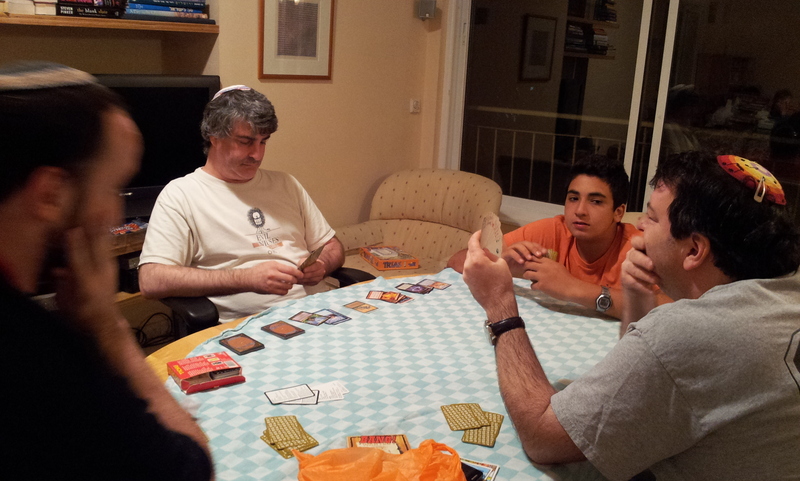 Also first time for Lorenzo, although he came previously to my house to play on shabbat. First play for Haim, second for Lorenzo, second (and probably last) for Nadine. This is not Nadine’s kind of game, as all of the decisions are spatially based. Lorenzo enjoyed it, and I like the game a lot, although I admit it’s better after you have played a few times to get the feel of how it works. Haim took to it well, although he ended up taking too many tiles. First play for both of them, both of them really enjoyed it. We played a game later in the evening. I started out winning. But my second disk removal gave him his first, and then he sneaked in two more, the last right before I would have taken off my third. First play for all but Nadine. Nadine may have met her match, since Lorenzo is a nuclear physicist who seems pretty on the ball. On the other hand, Nadine claims that her winning streak is in five-player games [ed: not true]. Everyone enjoyed it. First play for both of them. Eli arrived late and had to leave early, and I thought we could finish this in an hour, but they decided to try to scheme to see how to take me down (which I encouraged). They didn’t succeed at it, but Eli had to leave before the game was over, so we’ll never know. Part of the reason it took so long is that they kept trying to do things that the rules did not allow and then kept expressing a desire that the rules would be different to allow them to do these things. That’s the game! I had a shutout over Noam. Noam won five hands straight against me, earning a combined total of over 100 more points than I earned. Mazal tov to Mace on his marriage to Revi last week! We played about half a game before people had to leave; new to Mace and Ken. Gili added a stealing tile which messed her up. It seems to have big effect when one person doesn’t get to build, especially early in the game. 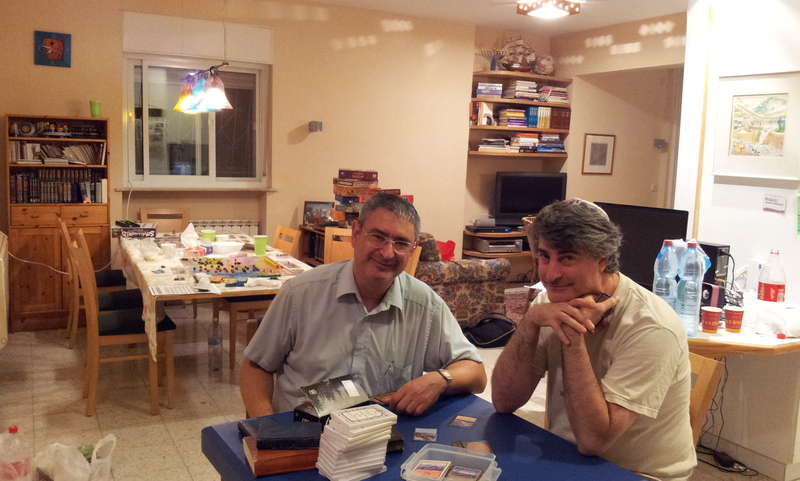 Jon: Oran finished his board and ended with 42, but Moshe had 3 dancing candles and won with 49. (Advanced version). Jon: I mis-taught the game. I forgot all about how the round and game ending point scoring worked. I simply had everyone toss down their cash to their limit without any chance for scoring, and I had everyone trade only 10 for 1 at the end of the game. Which doesn’t even make sense. Something small was bothering me during the game as we played, but not enough to make me look up the rules. I took the early lead and managed to keep it. I took the sheriff as fourth player in the first round. In rounds two and three, it was also not picked often. It was only picked first in round four. 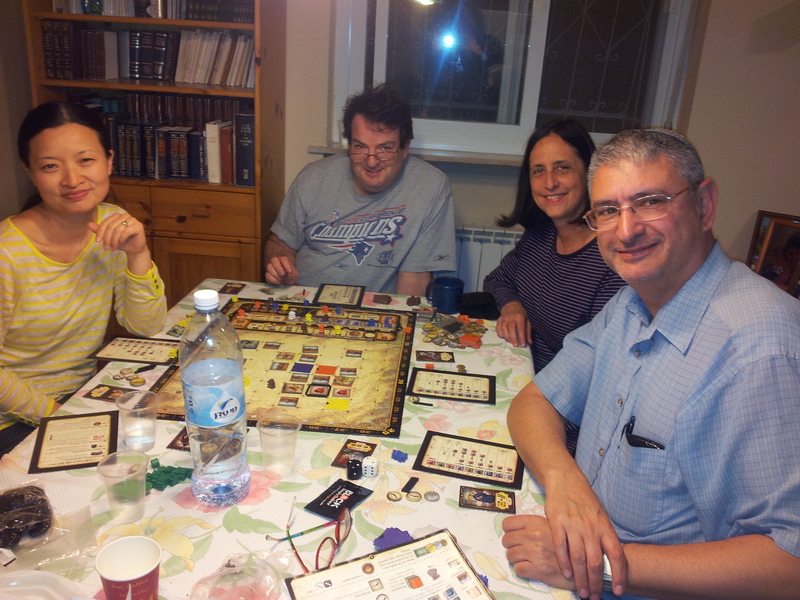 We developed a lot of the board, and – despite the rules flub – it was quite fun. 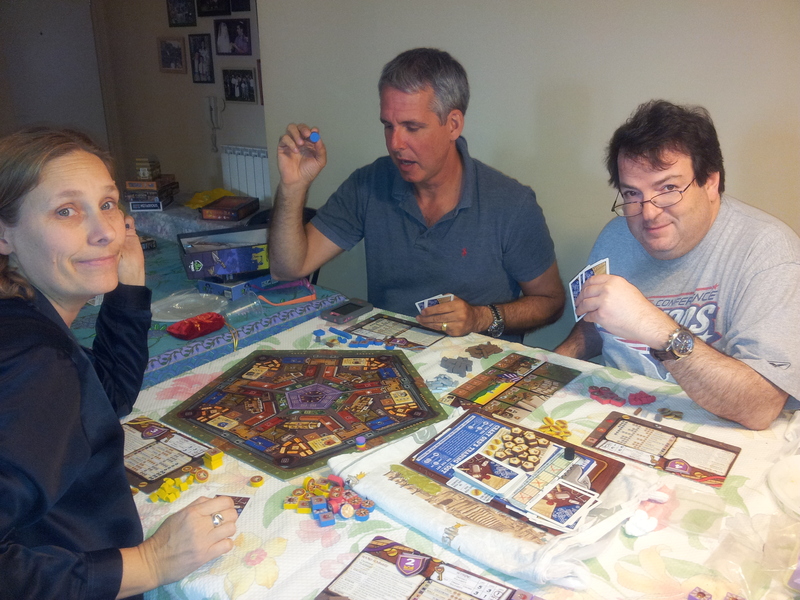 Bill left the second game during the explanation to play Lords of Waterdeep. First play for Ken and Shirley. David didn’t remember how to play and was hurt by joining in after the rules explanation. 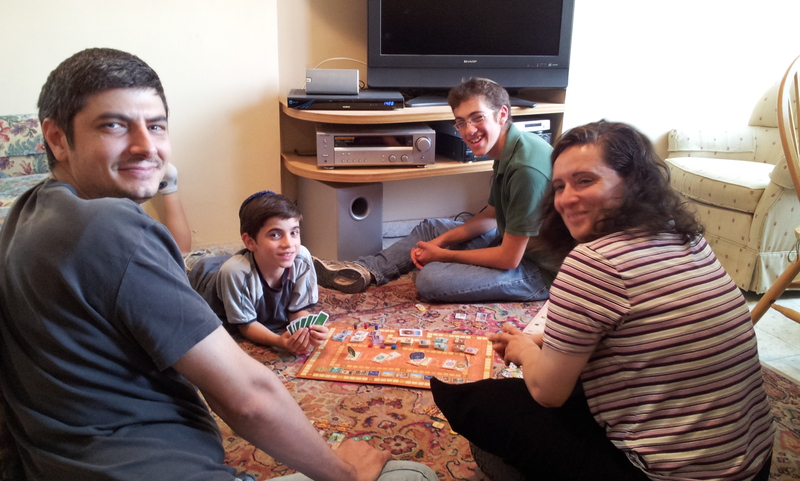 Shachar and Shlomia also played several games of this. Ofer had the most connections at the end. Jon: We played this correctly, though it was the first time I played it correctly. I always thought that every player had only one chance to fulfill a quest at the end of each round, which is very painful and introduces a bad element to the game if someone hits them with a forced quest. The real rules are much better (that is not always the case with rules mistakes, but it is in this case). I was ahead most of the game and thought I would squeak out a win, but I ended with no items left on my board and Gili ended with a whole bunch. We both had 24 points bonus from the correct quests at the end; I had a lot of synergy from plot quests to fulfill arcana quests. I’m still not quite sure how it all worked out there. Jon: I played two rounds of this and really don’t like the game. Jon: David and I drafted as usual, and Elliot came at the end. Since our drafts give us 45 cards each, we gave Elliot 60 random cards to make a deck. I played Green/White/Red, David played Red/White, and Elliot played Green/Red/Blue. We played three way Magic where we each had a 20 life point stack against each opponent and the game ends when one player has reduced the relevant life point stack of each opponent to 0. In theory, this means you can win even if you have lost both of your life stacks already. We had a lt of stalling since many of our creatures couldn’t get through, but Elliot had a flyer and David had a big guy who didn’t tap and had first strike (with an enchantment). David won the game. I killed his life point stack, but then he killed mine and used direct damage to finish off Elliot. One amusing thing that happened – or almost happened: Elliot used an enchantment to take possession of David’s big guy, which is what let me finish off David. I was then about to cast a global disenchant that would send the big guy back to David’s side, which would then allow me to finish off Elliot. One round too late. David and Elliot then played two player and David won again with the red direct damage. Jon: Even the winning scores were up in the 40s in both games. Mace used a cubes strategy, which he later transferred to the points area. Michael went into Notre Dame a lot. Emily only got positive tokens. Eitan dumped one card. Gili and I had been looking forward to playing the new game of the year, but were disappointed. Partly due to the build-up, but it’s not that exciting of a game. Minimal player interaction, and pretty straighforward. You do have calculations, and the energy mechanic is different, and the variety of groups makes the game different each time for good replayability. 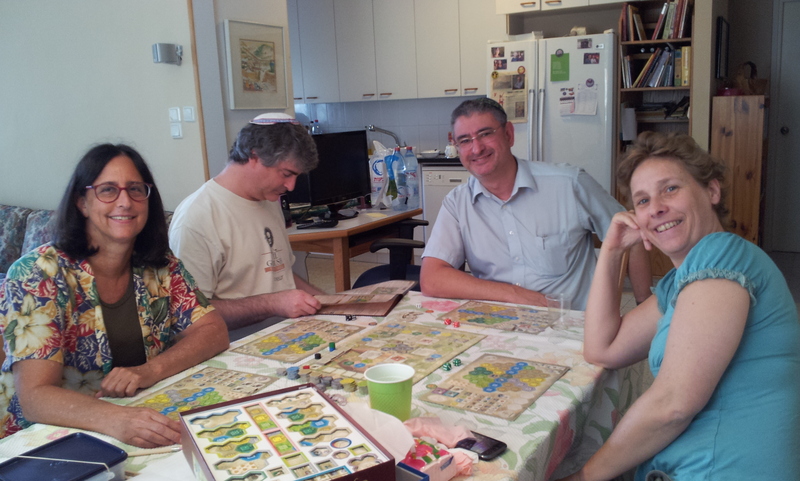 I don’t think it’s as fun or interesting as Tzolk’in and many other games. Jon: I learned the rules to the game in 30 minutes but opted to play Magic. I then turned around and taught the rules to David’s son Avi in less than 10 minutes before leaving. It doesn’t look bad, but it also doesn’t have any kind of wow factor at first glance, just a lot of rehashed mechanics I’ve seen before. Jon: Meir started off too concentrated on one side. Also, both Meir and Gili “re-learned” rules specifics as the game went on, which affected their earlier plays a bit. First play is a learning experience. Ofer taught this to Oran. I joined in as our shortened Belfor was wrapping up. 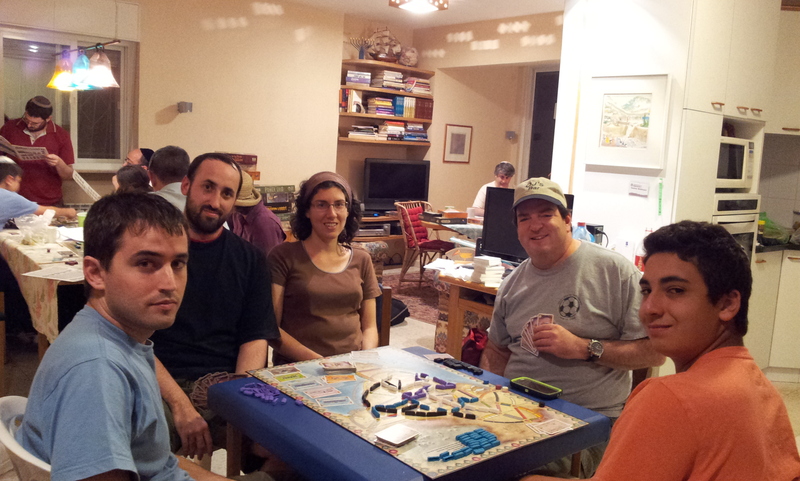 We played less than one season; after breaking for dinner Ofer and Oran had to leave to go back to Haifa. Thanks again to Emily for taking care of the dinner order. Thank you to all the participants for bringing games and snacks, and helping out with moving furniture in and out of our sukkah and our nice new neighbors’ sukkah. It was a cooperative and fun group of serious gamers. 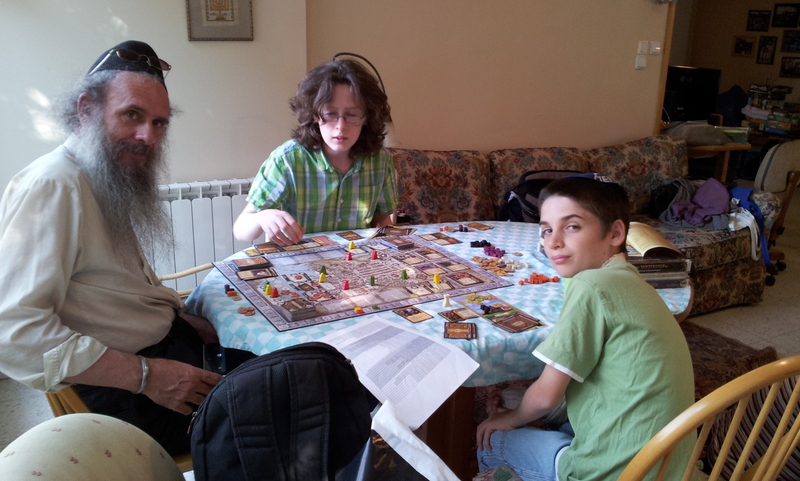 I discouraged first time Eurogamers – they get a much better introduction at our weekly sessions where we can spend time selecting and teaching an appropriate game. I remembered to get pictures of most the games, even the one I was playing in. Emily as usual did a great job with the dinner order, this time from Burgers Bar instead of Daisy Burger, they didn’t do as well at labeling the food. Abe , Emily and Eitan contributed to this session report. A few days before I had realized that I was going to miss the first Obama Romney debate due to the conflict with games day; otherwise I could have stayed up and slept in. Wednesday night I went to bed late after discussing a range of possible house rules with Abe to fix El Grande King and Intriguant, and wasn’t asleep at 3 so I got up to watch the debate. It was unbelievable so I ended up not sleeping much. It’s not often that political campaign events cause that level of surprise across the board. People at games were interested in hearing about it, and also surprised that there was such a clear winner. Laurie wanted to learn Niagara because she has the game but hasn’t played it. I played it at bgg.con, it’s short, strategic and fun. We kept putting off playing it to play other games, but when we went to play it at the end of the day we couldn’t find it, it had already been taken home. Next games day. Welcome back David, who brought his son Avi and nephew Yehuda. 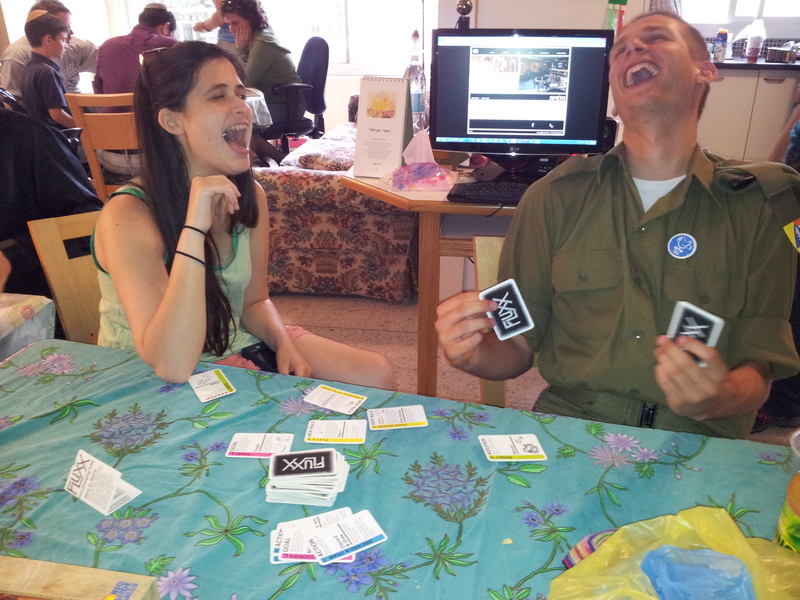 B’sha’a tova to Emily and Eitan, who are expecting a baby for Pesach Games Day! 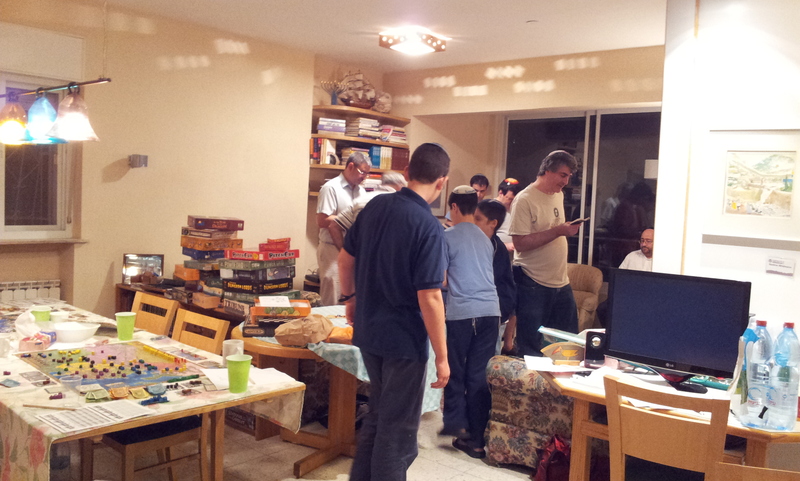 Playing started with Jon and David playing Magic and Avi and Yehuda warming up with R-Eco and Pitchcar, followed by Netanel beating Eitan, Emily, Michael, and Shalom at Pitchcar. Jon explained the game and pulled off his usual resounding victory partly due to the players not listening to his warnings to pay attention to victory points over combat. 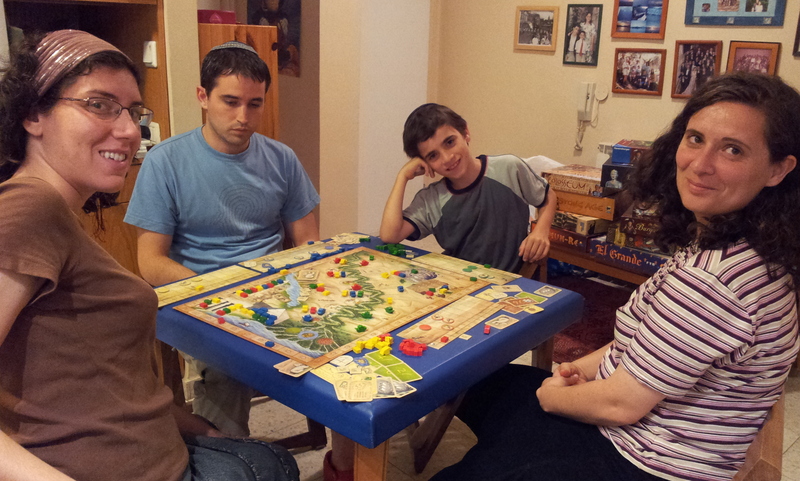 Jon did a good job of teaching this, he had played once and had to reread the rules; first play for the rest of us. It did take a long time, because we were new and had to look up what each building did every time, and due to a break while Jon taught Homesteaders. David and I took more time figuring out our moves, Jon complained but then said on the other hand we were winning. I don’t understand how I did better than Jon who planned better, but the things I focused on, such as trying not to use workers, helped, also maybe trying not to do too much. David had a trading strategy, with synergy of trading benefits. I avoided yellow chips because I wouldn’t be able to fill in the region and it takes more planning to benefit from them. I did animals because I understood how they worked, Gili started with them too, and then David also did animals, and Jon later too. At first I took chickens, and Jon asked why I was competing with Gili who had a chicken tile, which I hadn’t noticed, so I switched to sheep. I asked her why she hadn’t said anything, she said she thought I was purposely blocking her, which I wouldn’t have bothered doing in that situation. I didn’t understand how all the buildings worked, there are better ways to plan and do things in beneficial order, which is what Jon worked on. There is some luck in getting the right die numbers at the right time because mitigating with workers costs actions. 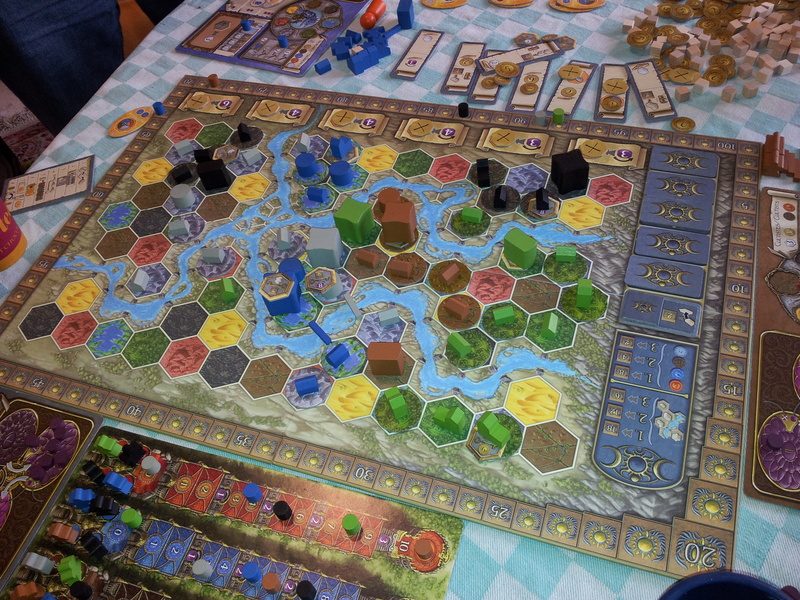 Jon was first player, getting one worker tile, I went last, getting 4, which may be unbalanced. Jon got points for finishing colors first, and he also scored higher for finishing regions earlier. I was second in two colors. I had 226 at the end, David 225, with Jon and Gili further back. First game of the day for everyone except Hershel. Everyone’s first play of Eclipse except for Hershel, who did an excellent job explaining and facilitating the game. Ken developed a nice fleet of ships laden with plasma missiles, but didn’t really have good places to move because of previous exploration patterns, and hardly got to use them the whole game. Hershel expanded quickly, took over huge tracts of space, and then also took over the center. Ofer built up a decent fleet of ships, found himself boxed in between Ken and Hershel, and then launched a valiant assault against Herschel in an attempt to conquer the center. Hershel responded by reinforcing the center with a quartet of starbases, and subsequently wiping out Ofer’s forces. Abe mostly stayed in his own corner and focused on racking up points by researching a lot of technologies, and was also the only player to build a monument. Oren controlled a good-sized area, and got a good amount of points from other sources as well. 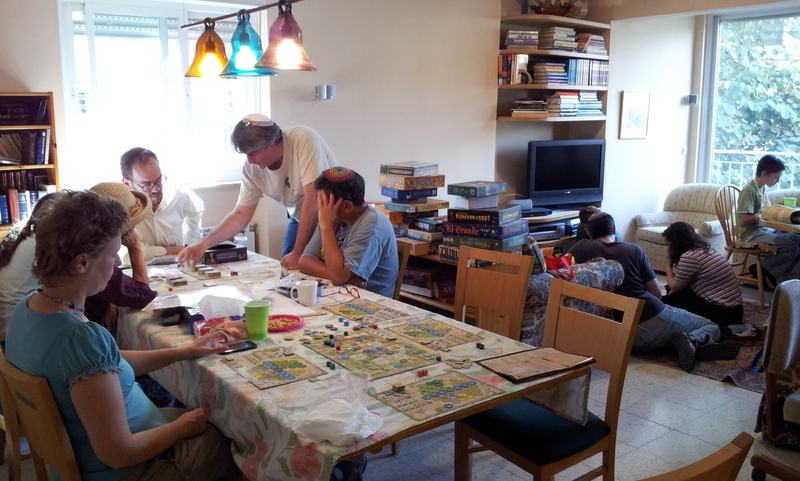 The battle that decided the game, though no one realized it at the time, was Oren’s loss to Herschel on Abe’s starting tile during the final round of the game. Oren sent several lesser ships against one of Herschel’s powerful ships. Oren came within one damage of winning, but couldn’t manage to get the final hit, and Hershel’s ship emerged victorious. The tile itself was worth 3 points, and Herschel also drew a high-value tile as a reward for winning. Had Oren won, either he or Abe would’ve won the game instead of Hershel, so it was close up until the end. Emily hurt Ofer in two rounds by moving the water ring, but he had a card to mitigate the effect. Emily had the Draw Plus 2 Sphinx card from the first round, and the You Can Go Upstream card, and Place a Ship in Occupied Space. Avi did well in this long game and was a very good sport even when his hoped for victory was thwarted. Shalom brought and taught this cooperative game. 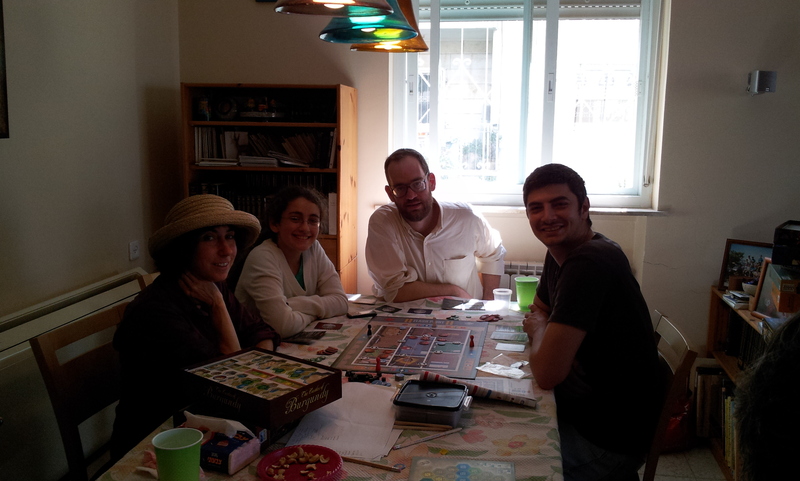 He, Michael, Yael and Laurie successfully put out the fire and rescued the victims before the house exploded, winning the game. New to Laurie, Avi and Yehuda, though Laurie thinks she played regular Ra once. 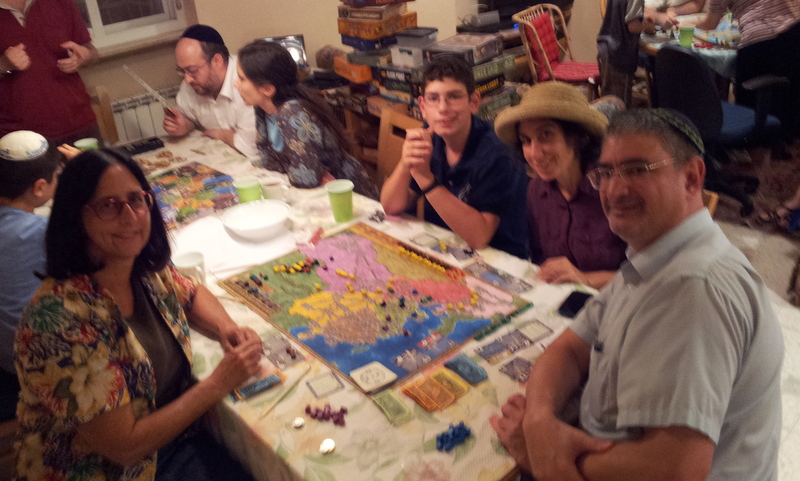 They all liked the game and my Jewish theming. I was ahead most of the game, stayed ahead in baskets, and didn’t have menorahs. 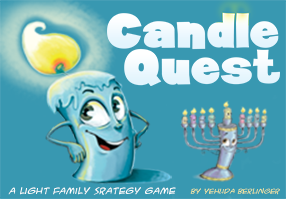 Avi and Yehuda sat out auctions in an effort to get candles for their numerous menorahs. David was negative til the end when he caught up with tribes, Laurie was also strong in tribes, and got the ark last round. David beat Jon 3 times. Eszter and one of her kids and Jon had started Trias, but it was a casualty of moving the table to make room for Maariv. Emily, Eitan and Avi were tied going in to the last round. Emily tried to fight a monster to end the game and Eitan was helping, but everyone else attacked them so they lost. Emily then helped Eitan ended the game and they won, they said they would have helped anyone win. They were accused of nepotism, but were actually cooperating less than the other relatives involved. We had a nice selection of boards from which to choose thanks to Ken who has them all. None of us had played on China, with changes including the cards coming out in order for most of the game, only 3 cards available for purchase with no replacements, and more limited fuel. I went last in buying cities the first round, so I was able to be in my own area, though that also meant that I missed out on the cheapest connections. David and I ended up competing for plants because we use the same approach. I paid 70 for a 6 plant, then David got one for 30 when Laurie didn’t fight him. She also didn’t buy out the coal, though because I went before David and bought what was left, he couldn’t run his plants. Yehuda was doing well, with high income, until I stocked up on oil to protect myself, which blocked him. We thought Laurie should have been more directly competitive, but she had her own strategy. Laurie built to 17 cities when she could power 13. I could power 17, so I would win if I could build to 14. We didn’t understand why she had built to 17. But I was $5 short, so could only build to 13. And she had way more money than I did, winning the tie decisively. If I hadn’t bought spare fuel for my oil and coal plants I would have had the money, but then David and Yehuda would have been in competitive positions, so great job Laurie! We messed up a few times, refilling oil less than it should have been, and making too few new power plants available. 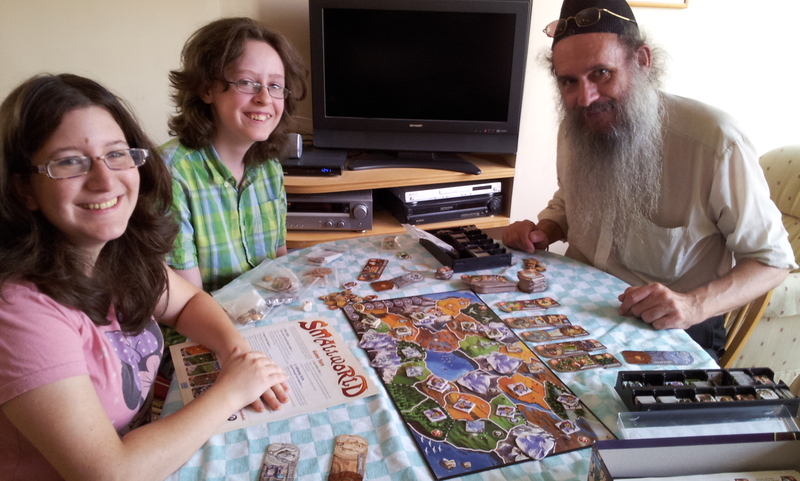 First play for everyone, except Eitan had played Small World Underground. Eitan said it was better than he expected from reviews; it played like its own game rather than a simpler version of Underground. Just like Underground, he lost, but enjoyed the experience. Jon and Ken found themselves down by 600 points early on, due to some ill-advised Tichu and Grand Tichu bids that failed. However, after falling behind, they kept chipping away at the lead, with a fair amount of hands with no Tichu bids whatsoever, but Jon and Ken usually claiming a majority of the points anyway. Eventually, they took the lead at 875 to 825, and then closed out the game by going out 1-2 on the last hand for the final 200 points. Oren was lucky in the beginning because his routes were in an uncontested area. Ksenia was able to join us again, for once. I think she was inspired after having won In the Shadow of the Emperor on shabbat. Also nice to see Sara coming more regularly. Scores approximate. First play of Dominion for Ksenia. Both Nadine and Ksenia started on VPs a tad too early, imho. 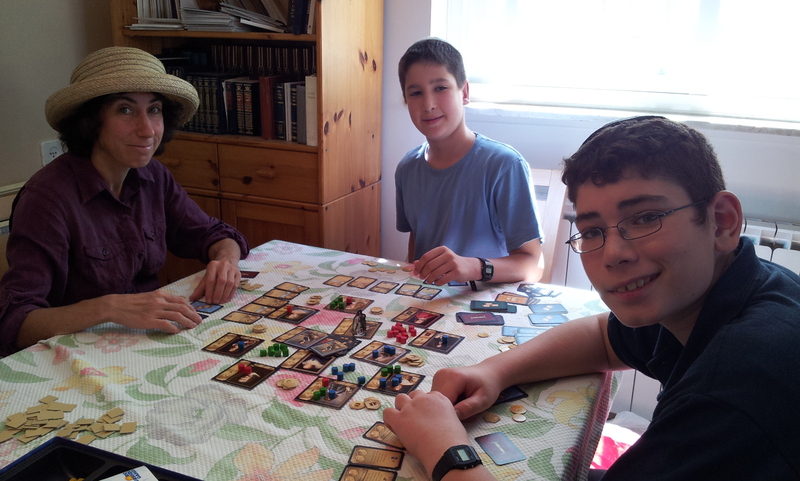 We played with the Seaside Village that give +3 actions and +2 gold which is incredibly under-priced at a measly 3 cost. Tack on some card drawing cards (such as Nobles) and the play was pretty straightforward. Ksenia also took a Sea Hag, who was a minor annoyance since there were no cards that trashed other cards. This may have been Sara’s first play. Abraham won by a good margin. First plays for Abraham and Sara. Trias is one of those games that I love to pieces but don’t get to play much because the older regulars in the group don’t like it that much. Luckily, Abraham and Sara and Eitan and Emily are relative newcomers and so I can inflict these games on them at least once. Also, Abraham is closer to my own feelings regarding which games he likes, and so he tends to like the games I like. He’s willing to play Santiago, for instance. Abraham and Sara both loved Trias, so I’m thrilled. It didn’t take them long to get the hang of the basics, so most of the game was spent on tactics. Abraham managed to leach hex after hex away from other islands onto one on which he was alone, and the end scores were close. But he wasn’t quite diverse enough, and I managed to end with control of a 12 hex island, which just edged me into first place. First plays for Ksenia and Emily. Nadine started teaching a different group of people, but people showed up during the explanation, thought of joining and then some of them split off to start another game. I only played Cuba twice, and while I like it, I find the horizontal/vertical building activation mechanic on the players’ boards annoying. In this game, according to Nadine’s notes: Nadine changed sugar into rum and shipped, Emily got money and had both shipping and building, and Ksenia had a blue stone and changed to VPs, but didn’t do it every turn. This was formed from the overflow of Cuba. First play for Eitan. A tie for David and Gili. Sara’s score is approximate. First play for me. Some have compared Reef Encounter to Tigris and Euphrates or Go. Tom Vasel even claimed that once you have Reef Encounter, you can trade away T&E. While I’ve only played one game, so far it appears that nothing could be further from the truth. The only thing that RE and T&E share are the player screens and the tiles. It’s certainly a pretty and colorful game, and the theme is fresh and interesting. It’s a good game, with quite a lot of depth to be explored. I enjoyed it fine, and will play again. But it’s no T&E. Not simply because it wasn’t as good as T&E, which it wasn’t. But because the strategies and tactics are so different from each other, it’s like comparing apples and Chevies. They’re simply different games, plain and simple. In RE, the object is to collect tiles of high value. You collect tiles by starting your turn with one of your markers on an area containing five or more tiles of the same color (you collect N-4 tiles from a reef that you eat). The values of the tiles are partially under your control during the game, though the values only matter at the end of the game. Each tile of a color will be worth between 1 to 5 points at the end of the game. So, in addition to your having to collect the tiles, you have to spend some time locking high values onto the color tiles that you are collecting. The same part of the board that controls the end values of the tile colors also controls which colors are “dominant” during game play. When one color is dominant over another, tiles of the dominant color can be used to kick tiles of the recessive color (replace them) off the board. You can use then use the tiles that you kick off the board to control the tile values/dominance, or you can place them back on the board later. At the end of each round, you get some more tiles from random piles, as well as a “control cube” – you spend a control cube on a color each time you want to place one or more tiles of that color. Lastly, you have four markers, which sit on reefs and protect the spaces immediately orthogonal to them from being eaten by other colors, regardless of which color is dominant. Add to that some wacky board geometry, and you spend a lot of your time trying to figure out where the best place on the board is to grow your reefs so that they can get big before you eat them – and without other people’s tiles eating yours before you can harvest them. In our game, both Sara and Abraham had large reefs that they ate, but Abraham got the colors locked in his favor. I had the choice on the last round which way to swing one of the tiles, and I swung it in favor of Abraham because I thought Sara had eaten more than Abraham had in his color specialty. Turns out I was wrong. If I had chose the other way, Abraham would have had 8 less points, and Sara 8 more points, and I would still probably have lost by a point or two. 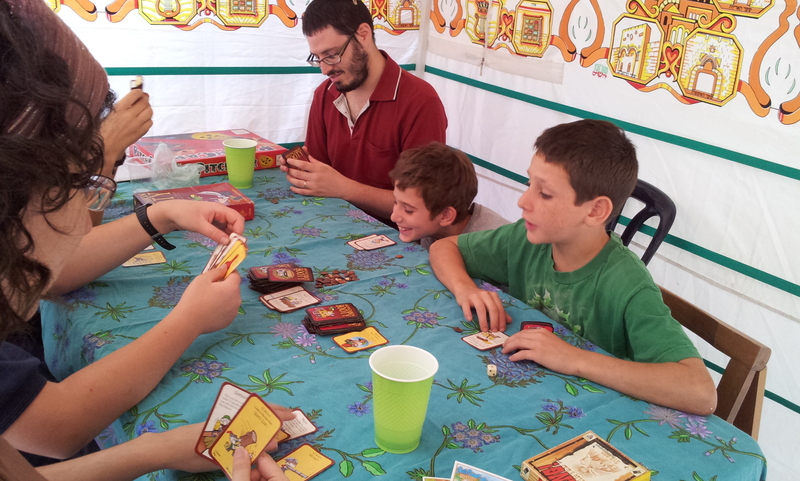 Also first play for Eitan, which surprised me. First play for Ksenia. This did not start out well for us. In the first round, they both went out first. The next round we gained 15 points to their 85. The third round we split 50/50. David and I had crappy hands all three times. Finally I got a decent pull and I called Grand Tichu (2 aces, 2 kings, Phoenix, jack, and 2 nines). It wasn’t a cakewalk, but I made it, plus another 50/50 break. We were still losing, and Nadine wanted to quit while they were ahead. I coerced her into playing one more round, in which David and I both went out. David went out first, and Nadine was on my right with only one card. And I had several cards and the Dog. Luckily, Nadine’s card wasn’t higher than a jack, and I was able to slowly play through all my cards and exit with the Dog. Noah comes for his first time. He made aliyah recently, so welcome aboard. He may be heading for ulpan or the army soon, however. Hershel returns for his second game night. And David brings back his young ‘un, Avi. First plays for both Hershel and Noah. I don’t remember much of the game. Played much later, this is my personal best for the game. Of course, it was two-player. I don’t know about this game, either. First play for Hershel. Lucky for me, I didn’t hear Nadine explaining the game to him. Nadine and Hershel both had good animals and ovens. First play for Noah. This one is much easier to explain to a new player, especially one with a strong math background. We played on the cheap East Coast of the US. I’m still fairly confused as to how one wins, though I suspect it has to do with some kind of perfect timing in the last three rounds. And a lot of that has to do with luck as to what plants are – and are not – available. First plays for both Noah and Avi. I don’t get to play this with the regulars, as they don’t like it. I still think it’s a fascinating, elegant game. 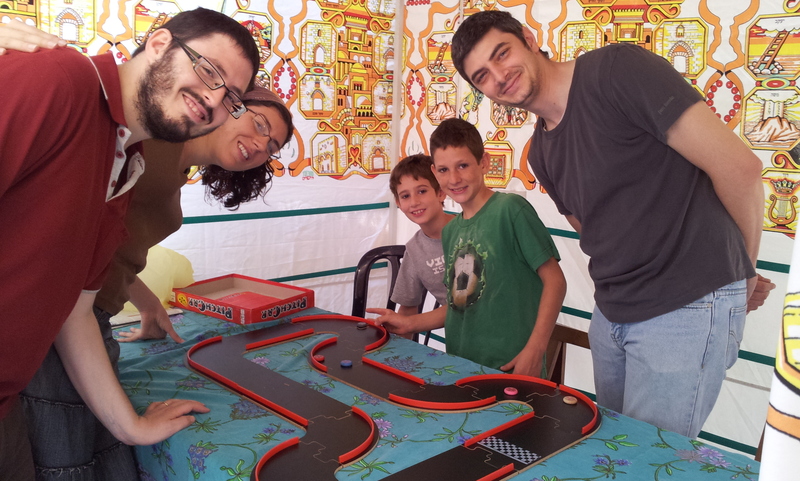 Avi was confused as to how the scoring worked, but he loved to drift extra tiles on his turn. The second island in our game already left the center tile completely isolated. We didn’t have much time, so we forgoed our usual draft and simply each pulled 68 cards. I had pathetic in everything but blue and green, so that’s what I played, with very light mana. David built a black, green, blue deck. David pulled perfect mana, perhaps a tad in excess. By round four, he had 5 mana available, while I was stuck at 2 for some time. I eventually pulled mana’s 3 and then 4 by the end of the game. That left my biggst cards unplayable, but I could get out most of the deck, one at a time. The creatures I got out were nearly all fliers, which David couldn’t stop. I pulled one card that killed his only annoying creature. And then I played a card that forced him to draw two cards and then discard four. Since he only had two cards in his hand at the time, it wiped out both a big creature he was poised to cast, and an enchantment that would have make it unblockable and untargetable. He didn’t draw anything else as useful after that, so I won. A miracle. I simply love this game. Honestly, I was expecting to thing that it was an ok filler. But it’s elegant mechanics and chaotic patterns are exactly my style. In the first game you have no idea what you’re doing and why, but it soon begins to come clear. Unfortunately, everyone else I’ve played it with at the group doesn’t feel the same way. Especially, there are some people who take a very long time to take their turns, ala Carcassonne. Nadine is one such person. She also claims that it’s simply not her style of game, being too spacial (yet somehow, she always seems to beat us at El Grande). 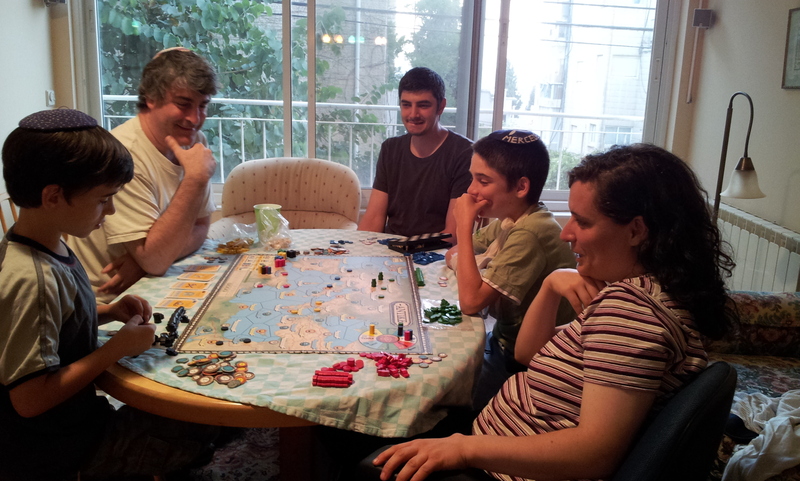 First play for Binyamin, who is especially irked when other people take a long time to play. I would like to play it 2-player a couple of times. Gili taught Avraham. The Kosmos two-player series is Gili’s type of game; I think they’re ok filler games. 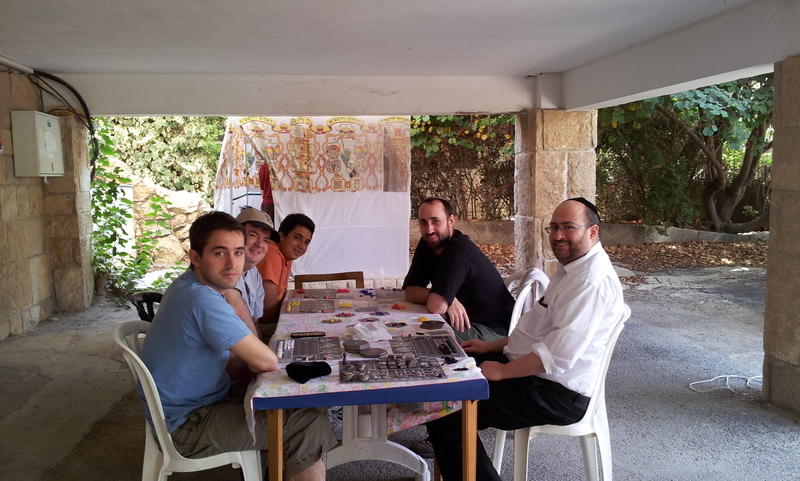 They didn’t have time to finish, but agreed that Avraham was probably winning. My third game of Antike, and another game that I simply love a whole lot more than I expected to. Possibly it’s because I’m playing with not too aggressive players; if I played with war-gamers I might feel differently. As for now, the game seems to be perfectly balanced, where the victory mechanics don’t favor aggression over non-aggression, or vice versa. Binyamin’s first play, Avraham’s second. I decided to try setting the victory condition to one less than the book indicates. It does make a difference. That one extra point would have dragged the game on into a lot more forced combat situations and probably close to another hour. We finished our game in under 2 hours. 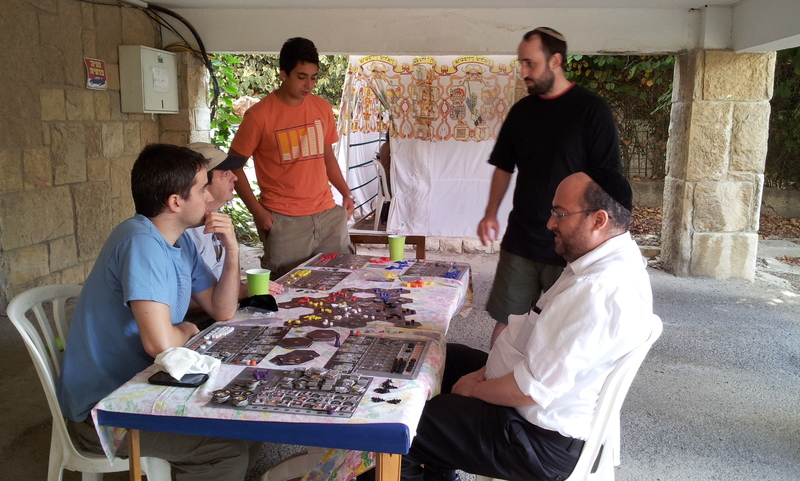 I started with gold and the first Know-How, but Binyamin quickly stifled my hopes of getting a landslide of those. I played Arabia, and pretty much had my side of the board to myself for most of the game. Just once, Avraham who played Greece conquered one of my outlying cities in the south. And I won the game with a quick unexpected strike to destroy one of Binyamin’s temples in the north. Binyamin started with two legions and expanded into 12 or 13 cities as his first several rounds. He then hit up against Avraham who attacked a number of his cities. He then concentrated on acquiring the rest of the Know-hows (he got 6, I think) and building temples. But he was too slow to win. Avraham also expanded early, but he spent too much time on expansion, building no temples and achieving no points through know-hows. He was still poised to win the game two turns after me. A favorite of all three of them, they consider it a tighter and less random version of Notre Dame. 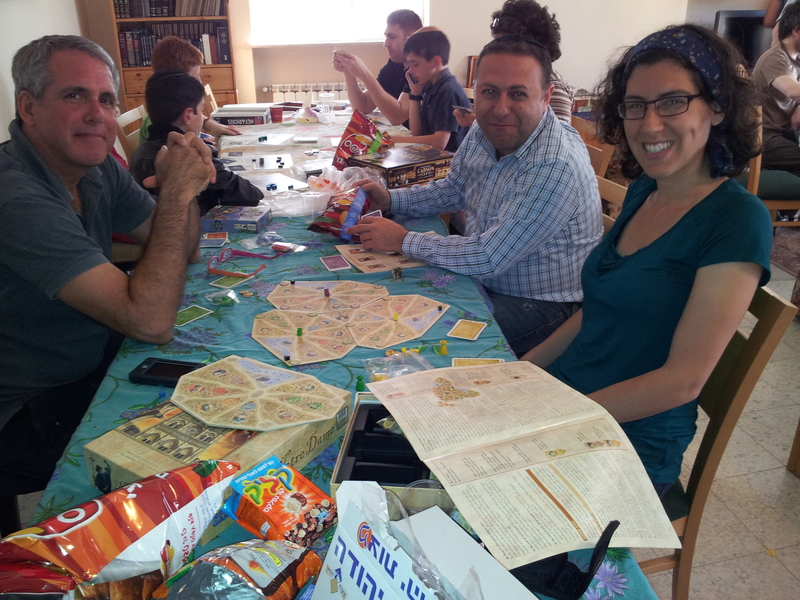 Avraham taught this game to both Binyamin and me. It’s a light filler game. To me, it seemed to fit into nearly the same space as R-Eco, with its point in four goods, piles of cards that appear and disappear, and low scoring. It’s also fairly chaotic and low on the planning side, with just enough planning to make you feel that you have some relevant decisions to make. This is probably exacerbated in a four-player game, and lessened in a two-player game, like all similar games with chaos. In our game, I probably should have one but I made two mistakes. The first one cost me a card. The second one gave Binyamin the shipment and lost me several cards and point opportunities. 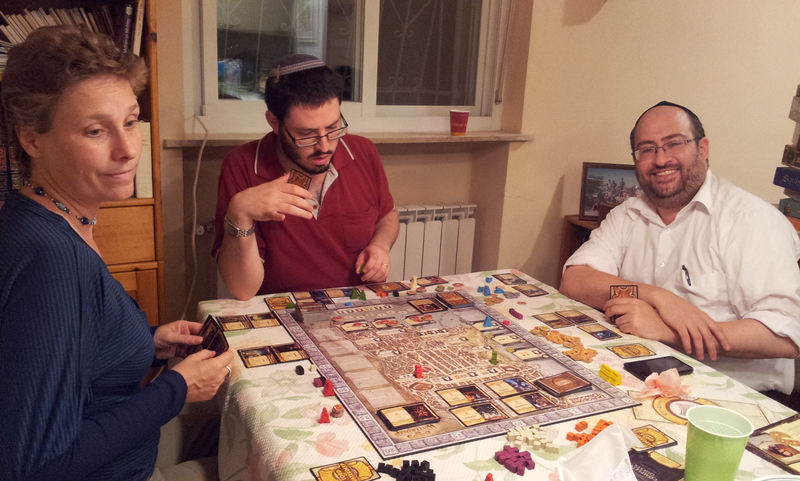 But Binyamin didn’t quite grasp the right plays. Between the two of us, we let Avraham take a close but smooth victory. 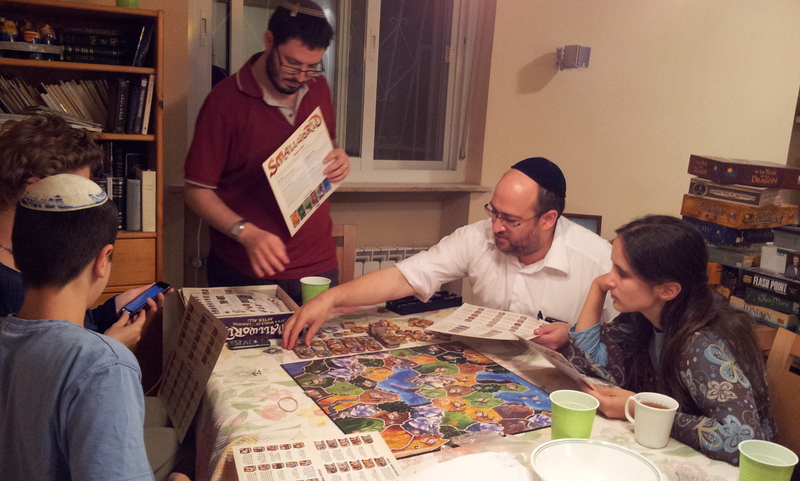 Avraham hasn’t played this (he’s played online? read the rules? ), so he teamed up with Nadine to play one position with Binyamin as partner. I ended up with all the points over four hands. I played the first three hands, and Avraham insisted on stealing the last hand, but went down two.